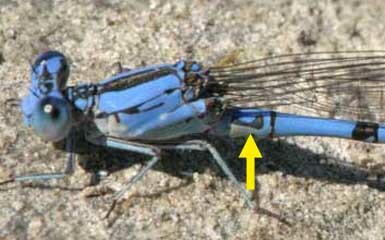 This Argia dancer (left and a close-up of the male's appendage below) is the only confirmed Aztec Dancer in Monterey County to date, although there were more nearby that were almost surely this species. About 10% of 300+ California/Aztec Dancers present were "pale" dancers, like this one which proved to be A. nahuana. More details follow. Aztec Dancer looks almost identical to California Dancer A. agrioides, and their ranges overlap considerably throughout California. There are a few spots in extreme northeastern California where only Aztec occurs (so far) and a few locales in the southeast where only California Dancer is known (so far), but they can occur together throughout the California foothills. Usually, though, one species is most abundant. In Monterey County, that common species is California Dancer. There are, however, specimens of Aztec Dancer in adjacent San Benito County. On 25 Aug 2007, Don Roberson and Paul Johnson were looking for odes along a stretch of the San Lorenzo River, on private land east of King City. Here the river forms the boundary between Monterey and San Benito counties (all photos here are from the MTY side). While Paul worked downstream, Don decided to try to sort through the hundreds of Argia dancers then ovipositing on flotsam in the river. He netted a random half-dozen (all A. agrioides) and then focused on photography. He noticed that there were a few "pale blue" males among the many bright blue male California Dancers; this photo (below) shows the two types together (pale one to the left, darker blue one to the right). The second segment here has a black spot or blotch at both the front and rear of the segment, here connected by a bar. Patterns with bars or two spots are shown often by California Dancer, but occur rarely, if at all, on Aztecs in this State. For practical field purposes, the observer can exclude Aztec on this character. The second segment here is unmarked except for a single spot or blotch at the rear of the segment. This pattern can be shown by either Aztec or California Dancers, so it does not exclude either. However, to be an Aztec, the damsel in question should show this pattern and not two spots or a bar. 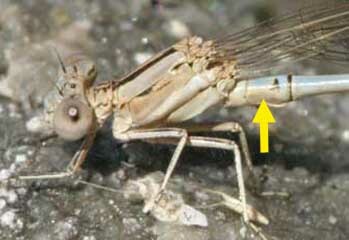 Every one of the "pale blue males" photographed on 25 August along the San Lorenzo showed the second pattern. In contrast, every one of the many bright and darker blue males photographed showed the first pattern. These could now easily be eliminated from consideration, leaving only a half-dozen "pale males" that showed the reduced single spot on the second segments. Included were adults males (just below) and a young male (below that, turning from brown to pale blue). Once one has narrowed down the California/Aztec Dancers to just the ones with relatively unmarked second segments, identification is made in-hand or in close-up photography by looking at the appendages (on males) or the mesostigmal plates (on females). I can only illustrate the identification of males here; for females, see figure 12 on p. 52 of Manolis (2003). 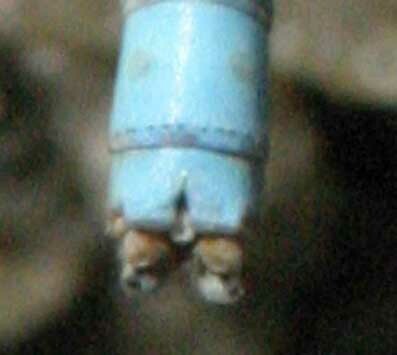 For males, although there are other differences in appendage details, the easiest to see is the relative width of the two torus, compared to the gap between them. One needs to get overhead with a clean dorsal view to do this comparison. 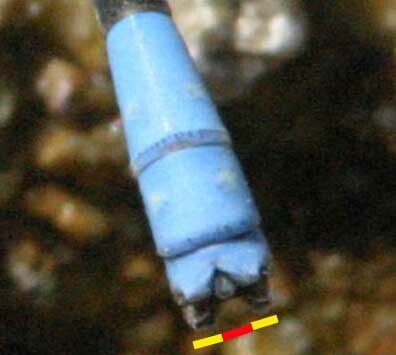 The differences are illustrated in the photos by yellow and red lines, but these lines are set off the tip of the appendages while, in fact, one needs to be comparing width at the base of the cerci, just at the end of the blue on the final segment. On California Dancer (below left) the gap between the tori (red) is about the same width as either torus (yellow). On Aztec Dancer (below right) the gap between the tori (red) is only about half as wide as either torus (yellow). As I looked through my photos of dozens of dancers from 25 August, I noticed an interesting thing. I had lots of photos of ovipositing tandems. This shot (below) shows five tandems together on the same reed. Nine of the ten individuals in this shot are oriented so that one can see the second segment on the males and the females in the large original image. Every single one is a California Dancer on that pattern — the pattern seems to work for females, and male California Dancers are mating with female California Dancers. On the few photos that showed tandems of "pale males" with second segments without much pattern (just a single spot), each of those males was mating with a female showing a similar pattern on her second segment. I think it is very probable that all such tandems were Aztec Dancers — in other words, at this site at least, the observer can segregate the two species on the basis of over color (paler blue males) and the pattern of the second segments (plan with a single basal spot). While apparently there is substantial overlap in these characters elsewhere in the West, but here, at least, they might be separable through a binocular view. This will need more testing, but is an interesting idea. 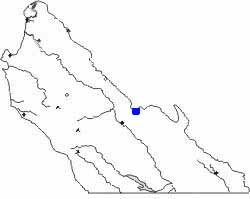 The map shows the location of the only currently known location for Aztec Dancer in MTY: along the San Lorenzo River east of King City. Perhaps 30 or so were present along a short stretch of river on 25 Aug 2007 (assuming all the "pale blue males" and tandems were Aztecs. It would seem logical to assume they occur elsewhere along this and similar rivers on the eastern flank on the county, and perhaps elsewhere. Elsewhere in California, flight dates range from March to November (Manolis 2003). In MTY the records to date are from late August.